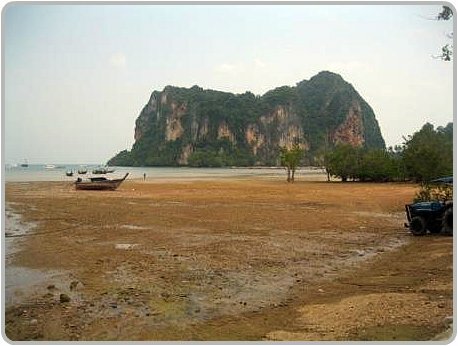 East Railay Beach is the least attractive beach out of the four beaches within the Railay peninsula. 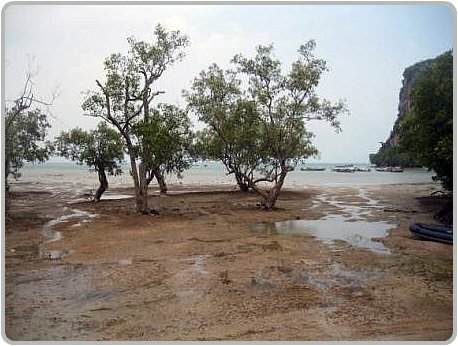 The beach itself is lined by mangrove trees and is used as the main pier for longtail taxi boats that arrive from Krabi and Ao Nang. There is no pier as such at East Railay, on low tide longtail boats are unable to moor on the shore leaving their passengers to walk in knee deep water and slippery mud to reach the shore. Whilst this is not a problem for most people, elderly people or those unsteady on their feet might may find this a bit challenging. 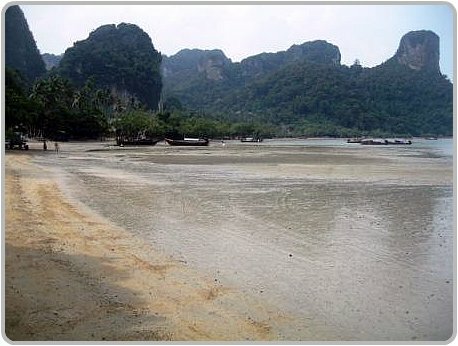 Whilst East Railay beach doesn’t have a beautiful beach like West Railay and Phra Nang beaches. There is a good variety of accommodation to choose from at East Railay, including affordable hotels, resorts and cheap bungalows of which are priced to suit all budgets. East Railay boasts a variety of restaurants and bars which are more affordable then what you will find on West Railay or Phra Nang Beach. The nightlife on the eastern side of the Peninsula is somewhat different to what is offered at West Railay. There is a selection of good bars such as Joy’s Bar, the Skunk Bar, the Bamboo Bar and the Last Bar which has a fantastic atmosphere, great food and features live music and fire shows. Facilities at East Railay include a first aid clinic, internet cafes, tour offices and mini marts, however the mini marts are more expensive compared to the prices at Ao Nang. 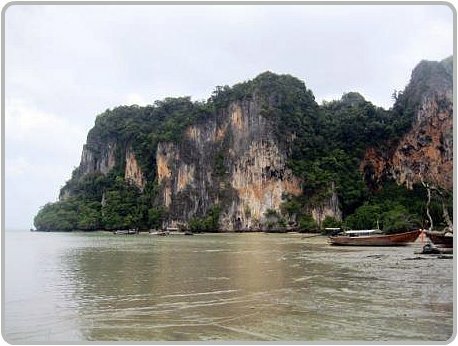 The main activities on the Railay Peninsula are rock climbing, cliff jumping and deep water soloing. 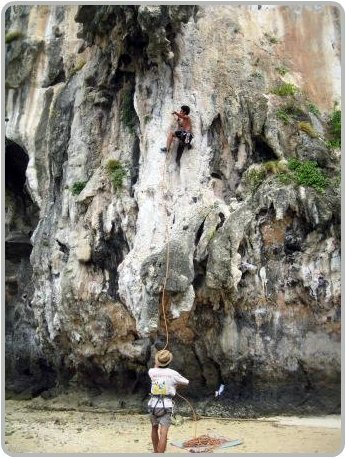 There are many rock climbing schools located around eastern side of the peninsular. 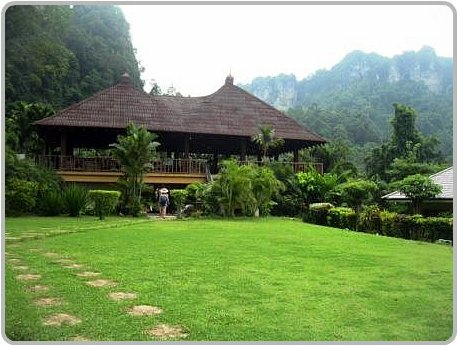 If rock climbing is not your thing, maybe you would like to go to Phutawan Resort where you will find the only Thai cooking school on the Peninsula and join in and learn how to cook Thai food. Although East Railay is not suitable for swimming; it is only a short 10 minute walk to the beautiful West Railay or Phra Nang Beaches, were you can spend your days basking in the sun and enjoying all the activities. It's easy to find just follow the paths that wind around the resorts to gain access to West Railay Beach or follow the path along the beach and around the base of the cliff until you reach Phra Nang beach. Longtail boats From Ao Nang to East Railay - Tonsai - West Railay or Phra Nang Beach cost 100 baht per person or 200 baht return. Read what other travellers have to say about Railay beaches on TripAdvisor.